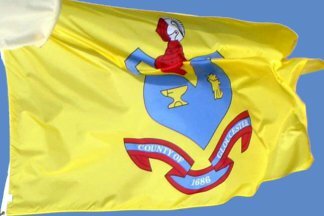 The Gloucester County flag was adopted on 21 July 1960. It is a matter of interest that the County of Gloucester had never adopted an official Seal or Flag in its 274 years of existence until the Board of Freeholders in 1960 - aware of the lack of these official emblems - sponsored a contest among the school children of the County for the purpose of developing an interest in the history of the County and to obtain the children's ideas of an appropriate design for both the Seal and flag. After the winning designs had been established by a special committee of the Gloucester County Historical Society, this committee pursued the subject further, and after frequent conferences with authorities on heraldry, consultation with expert designers and guidance and advice from officials of Gloucestershire, England, from which area this county took its name, a design for both the official County Seal and County Flag was submitted to the Board of Freeholders for their consideration. On July 21, 1960 , the Board approved the design and by unanimous vote adopted it for official county use for both the County Seal and Flag. The official County Seal is deserving of some explanation. The grated silver helmet, in profile, is indicative of princely status. In the instance of the helmet, the committee borrowed from the New Jersey State Seal which shows a grated gold helmet in direct view and which is significant of sovereignty. The County being lesser than the State justifies the arrangement of the helmet in profile and in silver. Beneath the helmet and in the triangle is a red cross. This is the St. George Cross and is one of the principal symbols in the coat of arms of the Duke of Gloucester - that section of England from which our County took its name. This establishes the relationship of our County and the County of Gloucester in England . It is also indicative of morality. Beneath the triangle enclosing the cross are two symbols: the anvil, which is indicative of labor and industry for which our County is noted and justly proud, and a shock of wheat or corn which is indicative of prosperity and agriculture. Beneath the complete shield of the design is a scroll inscribed " County of Gloucester " with the date "1686" and an engraved circle with the words "The Great Seal of the County of Gloucester, New Jersey". - The Gloucester County Blues - Hugh L.Mehorter , past president, Gloucester County Historical Society.